Yebhi Gold offer 100 off on 150 Discount Coupon. Yebhi another Coupon and this time for small amount purchase. Surf the website get deodrants, Socks, Lingerie, and much more. If you are new to Yebhi.com then watch this below video to know how to apply coupon code. Brew up your senses with Cappuccino or Mocha or Latte for only Re. 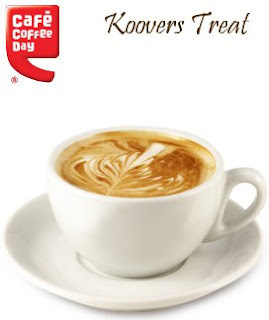 1, get a voucher of Cafe Coffee Day worth Rs 70! The Offer is valid on Cappuccino/ TA Cappuccino, Mocha and Café Latte. Grab and brew, because 'a lot can happen over coffee'! Location: All Outlets across India except Coffee Day Square Mumbai Airport, Cafes Big Bazar, Bangalore Cub & Spencer's Cafe Bangalore & Reliance Cochin. 3. After completing the payment you will get an e-mail and link for Koovs coupon which will be available under "My Koovs" section on the right. 4. Take a print of your exclusive Koovs coupon and carry it to the CCD outlet to avail the discount. Cafe Coffee Day is India's favourite coffee shop, for all. Part of India's largest coffee conglomerate, the Amalgamated Bean Coffee Trading Company, there's over 10,000 acres of rolling hills with the coffee shrubs making for lovely walks. CCD brought in the concept of cafes in India. The first one opened in 1996 on Brigade Road in Bangalore. It's been an exciting journey since then, becoming the largest organized retail cafe chain in the country. Oh, and if your travels take you to Vienna or Karachi Prague, do stop by CCDs there for taste of the brew from home.